I am amazed — I have found it impossible to raise funding to further my research as it seems money goes to research labs where there may be an end product. I am an 88 year-old living on a low pension needing much money to “Roll-out” my very special Chemical-free honeybee. blog/mystery-of-the-superbees-solved/ The full link is below for you to open. What MYSTERY and What’s been SOLVED? There is no Mystery (or problem) so nothing to solve so why the headliner? I ask the author of that article “If you really feel there is a mystery, tell me why you should think that; then give me some cash and I will endeavor to solve it, one way or the other”. I have often written that my bees could see the end of using Chemical-Controls against varroa build-up and that the chemical manufacturers would love to keep selling their dangerous products to beekeepers. A further concern I have about chemicals, which is a proven fact with the human abuse of Anti-biotics, some varroa WILL become immune to many chemicals when only being marginally affected giving them a form of ‘Flue-jab immunization’. This can only lead to stronger, therefore more dangerous varroa needing even more dangerous chemicals than those already in use. My bees (and varroa) are immune to DWV and been chemical-free since 1995. Though this does not reduce varroa numbers They have two other strings to their bow to do that, they groom and kill high percentages of adult varroa and also uncap and remove afflicted cells thus preventing baby varroa ever reaching adulthood. 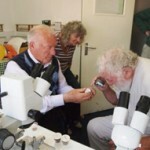 Three methods to fight varroa causing harm, no less. Several beekeepers in and around Swindon no longer use chemicals and have not done so for years. (My drones appear to be doing a good job). I have widely sold bees and queens but have not had, or sought much feedback about their continued varroa tolerance. I suspect that many still persist using chemicals fearing losing their bees or being called irresponsible. However, it appears to me that VITA-Europe apparently know more about my bees than I do, or are they running scared they might lose a money making market? I cannot understand why they felt the need to speak out at all? Unfortunately, simply moving Hoskins’ bees to another apiary where DWV Type A is dominant is likely to be futile. The colony is likely to be swamped by the lethal Type A and face the disease threat common to most colonies. They don’t know that anymore than I do. I need more funding to give away colonies of bees to beekeepers whose bees have DWV-A. Then, and only then, will anyone know “What is LIKELY to HAPPEN”. Most beekeepers are still treating their hives with chemicals and probably do not need to do so. It is drummed into them as part of today’s beekeeping. If your bees show the obvious signs of DWV-A then buy one of my queens and destroy your queen. Then breed more queens (and drones) from my queen to re-queen all your hives hopefully to see damaged wings no more! it could work even if mating with your local drones. Then let me know how you got on. I’d like to know. 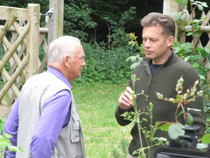 BBC South West have produced a film presented by Chris Packham showing the ground breaking work we’ve been doing over the past 20 years together with recent scientific findings. Some of the pictures in the video are not of my hives or my bees. My bees do not have DWV. Read about our latest developments and the continued work we are doing with different organisations. Having achieved major successes we are now confident that we are able to selectively breed bees which mostly are able to fend for themselves against the Varroa Mite without mans’ chemical interventions. Swarms from our hives, not collected and hived, will once again survive in the wild to kick-start the revival of British Feral Honeybees, essential for all of us and for the survival of wildlife and flora in remote regions where beekeepers do not keep bees. As all development and breeding has taken place in our apiary near Swindon, we are conscious that only a limited area of bees has the benefit of receiving genes from our drones (males) when mating in flight. When the number of bees become too strong for the 5-frame nucleus hive the beekeeper will be allowed to keep the bees and their frames in a hive they own, to still produce hygienic bees and drones in their location. Our hive will be returned to us with the lens and microscope, etc., for restocking and placement with new beekeepers outside Swindon, increasing the footprint even further every time. During following seasons our plans are to continue this very important program over ever widening areas. This essential conservation on-going project is believed to be unique In Britain; maybe in the world. 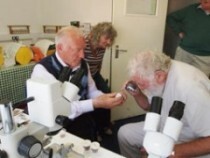 Ron chats to David Bellamy about his research. 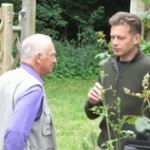 Chris Packham talked to Ron about his work to eradicate the Varroa mite. Read more about the Springwatch visit.